a new Star for the garden. Recent introduction with spotted flowers. Purple and white blooms reminiscent of constellations in the night sky. Early flowering - blooms from May-September. Supplied as 12 Jumbo Plug Plants Flowers from May until first frosts in the autumn. Not frost hardy so keep protected until the last frost. Pot on for 3-4weeks before planting. 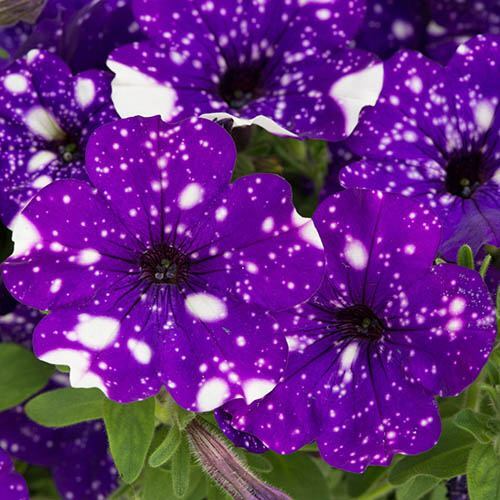 Petunia 'Night Sky is dramatically different and light years from any Petunia that's gone before! It has won many Trade Awards in 2015 ahead of it's first supply to UK gardeners from 2016, and has caused a Wow! wherever it has been seen. It produces masses of velvety indigo blue flowers with a host of pure white flecks and spots - just like gazing into a far-away galaxy - quite unique amongst any flower we have ever seen. When the plant is flowering in its full glory through summer these are truly reminiscent of the constellations viewed above on a clear night. Night Sky forms a mounded yet gently trailing plant which is perfect for all baskets and patio planters. It's early flowering, blooming from May right to the end of summer. Be the envy of your neighbours and be one of the first to grow this superb new plant and hurry as stocks are limited in this launch year. Make sure you get yours as stocks are limited. Order early please. Supplied as 12 Jumbo Plug Plants (2.5 - 3.5cm Diameter). Flowers from May until first frosts in the autumn. Not frost hardy so keep protected until the last frost. Pot on for 3-4weeks before planting.